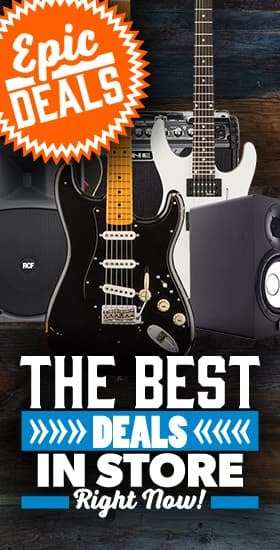 Bass Guitars - Andertons Music Co. Welcome to the Andertons Music Co. Bass Department! Check out our wide-ranging bass catalogue with brands like Fender, Gibson, Spector, Warwick, Sire Marcus Miller, Ibanez and more available in-store and online today. Over the last few years we have massively grown our bass department to stock something for every player no matter your style. With over 800 basses, nearly 200 amps and a wide range of pedals available to order today we are sure you will find something. After something classic? Well we stock a wide range of Fender Jazz and Fender Precision basses from their budget friendly standard range all the way up to their premium Custom Shop models. If you swing a bit more modern then maybe brands like Sire Marcus Miller with their powerful industry leading preamps yet vintage style are more your type. For those that want performance and power we have plenty of options in our modern bass guitar department. Warwick, Spector, Ibanez and Yamaha who all put performance first in their designs for the most comfortable and versatile basses you can find today. We have bass amps in all shapes and sized with options from Fender, Aguilar, Darkglass, Markbass, Orange, TC Electronic, Laney and more! From home practice amps to valve behemoths we always keep a great range available to order. To help refine your tone and expand your pedalboard we always keep stock of the latest bass pedals including Darkglass, BOSS, MXR, Tech 21, Electro Harmonix and more. No matter if you want to add a subtle effect or a complete tone shaping monster to your pedalboard there is something here.